Much hue and cry is being made about the nature of privacy today. Secrecy/privacy is required in nearly all human activity taking place in Status-Quo economic systems. There are personal secrets in intimate relationships, family secrets kept within the family, business secrets preserved for earning profit and market share, government secrets. Government secrets are en vogue. 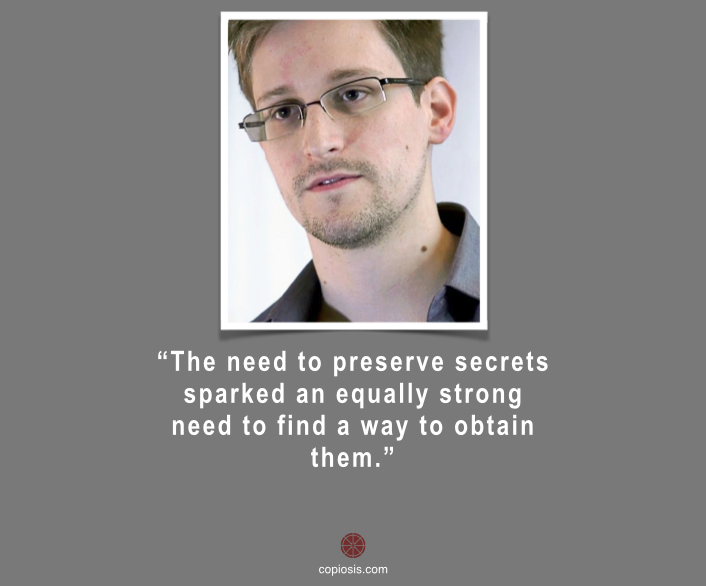 Especially with the Snowden leaks and the president’s today about the NSA’s surveillance program. Funny, the need to preserve secrets sparked an equally strong need to find a way to obtain them. Millions of dollars can be made from obtaining some secrets. Even personal secrets in intimate relationships can be worth millions. A technology war – also worth millions if not billions – has thus ensued as people try to protect their privacy/secrets from others trying to obtain them. That describes all dominant Status-Quo economies in the world today. It is no wonder then that this quote makes sense. The majority of people live in such societies. As such, we are vulnerable. If you’re working where you have no real control over your income (can you be fired from your job? ), you are vulnerable. If you’re saddled with debt, you are vulnerable. If your money can be taken against your will, by anyone – including an angry and soon-to-be divorced spouse, a swindler, or your government, you’re vulnerable. If you’re dependent on your spouse’s income, you’re vulnerable. If you have a secret you’re vulnerable. And because of all the reasons above and more, if someone else knows about your secret, you’re vulnerable. You’re vulnerable because other people are in the same position you are. Sometimes, exposing your vulnerability lessens another’s vulnerability, as in when people earn money for selling secrets about their celebrity friends. More so if your secret results in social embarrassment. Privacy, when practiced in Status-Quo economies, almost guarantees someone at sometime falls prey to coercion – at the hands of a spouse, a friend or family member, a co-worker, boss, or society at large. Technology has made privacy old-fashioned. Advances allow transparency into almost anything about us. The problem isn’t the potential loss of privacy. That’s always been the case. The problem is the marketability of that information. Others have explored this. The point here is our private information is a market – a place for people to earn vast sums. Current economies and advancing technology make keeping private information private impossible. The NSA has proven that, as have many private “Big Data” companies making billions off your every move, you’re every feature, and, yes, your every keystroke. Privacy is an inherent value to human beings. Here’s how to restore it. As with many problems we face today, permanent solutions can’t occur within Status-Quo economies. Status-Quo economies are the problem. Privacy invasion, like poverty, wealth inequality, plutocracy, corruption, environmental destruction and more, are symptoms. Trying to solve the privacy problem by in isolation is like an oncologist trying to treat throat cancer by giving the patient a throat lozenge because she complains of a sore throat. Record all activity taking place by every human being. This is being done today for the most part. It’s an easy matter to expand it to total collection. Before you freak out: There are many great reasons for this. We’ll explain why in a future post. If we forget, remind us. Make all activities recorded the private property of the individual conducting such activities. This data is valuable to the individual. It has critical medical value, personal security and safety value as well. It also can aid individuals in their growth and self expression, such as self-improvement, memory, personal mapping, and other applications that haven’t been invented yet. Use open source software solutions to encrypt the data. Open source software today protects databases of vital importance to government and business. It has proven to be a significant source of robust systems, including systems designed to protect data. Make the process in step three totally transparent and open so that people know what is happening with the encrypted files and who has access to them. Eliminate incentives inspiring people to want access to other people’s private data. Kiboshing the desire people might have to access other people’s data gets us more than halfway to solving the problem. Eliminate the value that comes from other people obtaining the data. This step is different from step five. We suggest making it not only fruitless, but costly in the extreme. Make is impossible to gain in trading private information. This is different from step six. We suggest making it not only fruitless, but costly in the extreme too. Significantly reward people who contribute to ensuring the previous seven steps remain in place, but only those people who would find extreme personal satisfaction doing so. Passion drives excellence. Rewarding passion through increased financial wealth, social recognition and gratitude and asset accumulation motivates the passionate to do more of what they do well. Status-Quo socioeconomic systems can’t do these eight steps. The main problem is that other people’s private information is too valuable. And the system itself compels people through the “earning a living” game to do almost anything possible to earn money. There’s an old Eastern saying. It goes: “When the student is ready, the master appears.” I’ll adapt this bit of Zen wisdom so it fits the topic: “When the people are ready, the system best suited for them emerges.” The people are increasingly calling for social and economic features current systems are inadequate to provide. The one best suited for an evolved human civilization is already emerging. When our current systems have been left behind, and this new one becomes the dominant system, it will be a good day. A good day indeed.